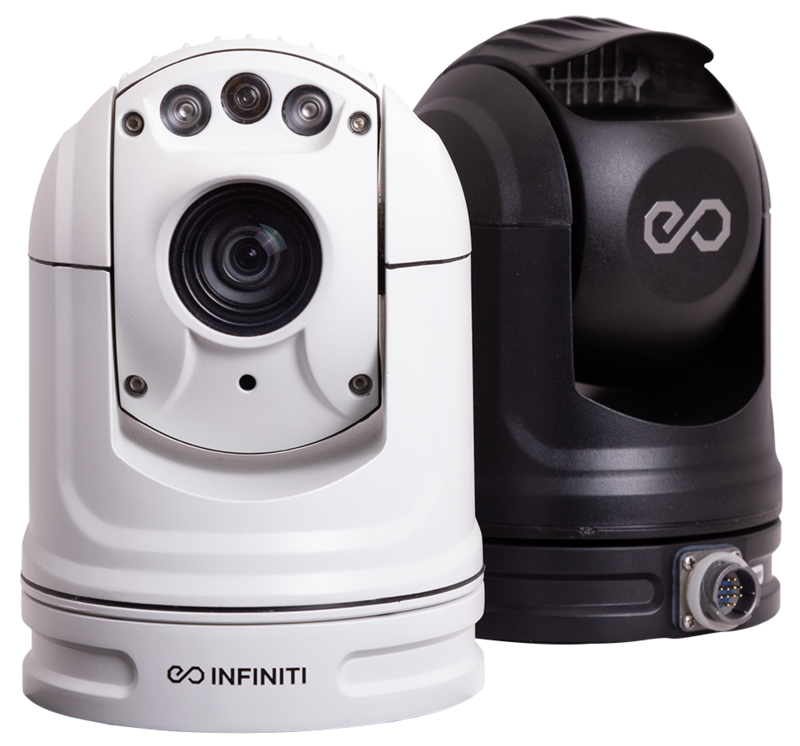 We’ve packed the incredible imaging of our 30X lens into a compact and robust package. 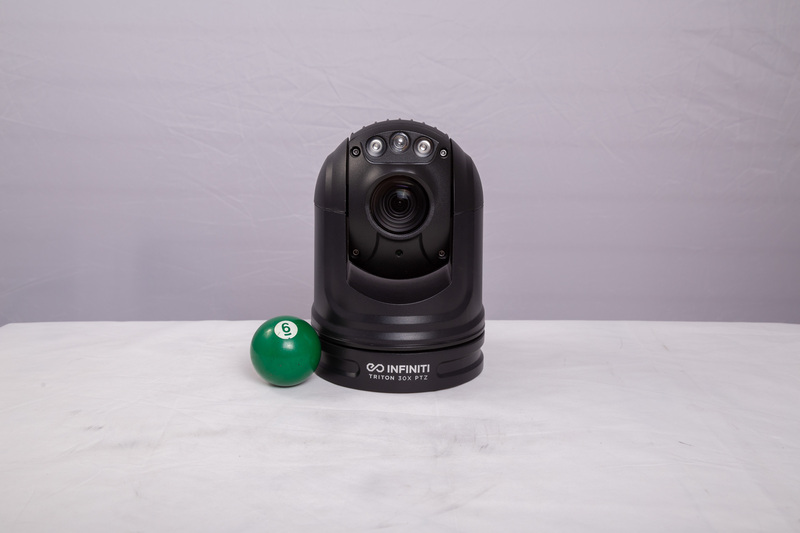 Small enough for mobile deployment with zoom performance that rivals much larger PTZ camera systems, this rugged PTZ camera excels in both practical and extreme applications. Ideal for mobile field surveillance, rapid deployment situations, and anywhere else a compact, high performance PTZ is needed, the Triton will not disappoint. The 4.5–135mm zoom lens offers incredible 30X optical zoom performance. The built-in magnetic mount caters to a variety of application environments. The compact, lightweight design enables easy mobility without compromising on optical performance. No matter the time of day. 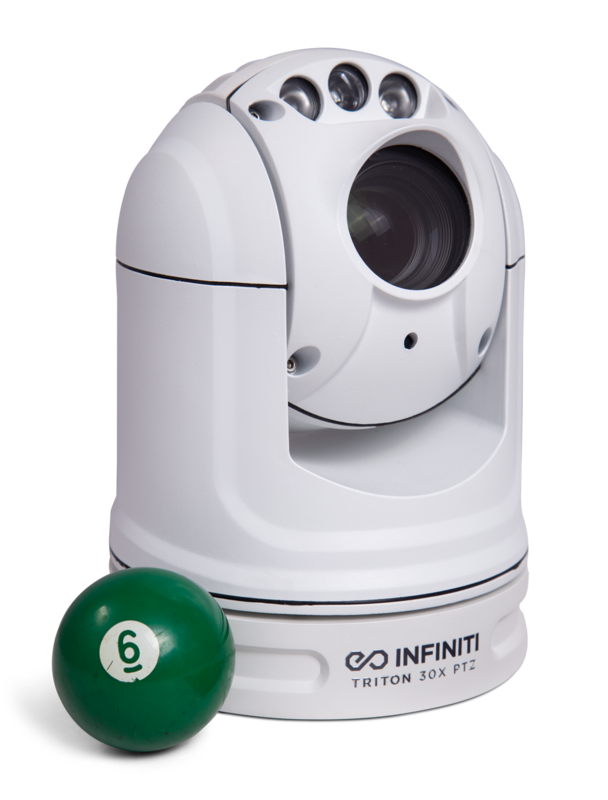 The Triton’s automatic IR illumination allows it to see in all lighting conditions. Get closer and capture the more detail on distant subjects with the impressive 30X optical zoom of the Triton’s 4.5–135mm lens. 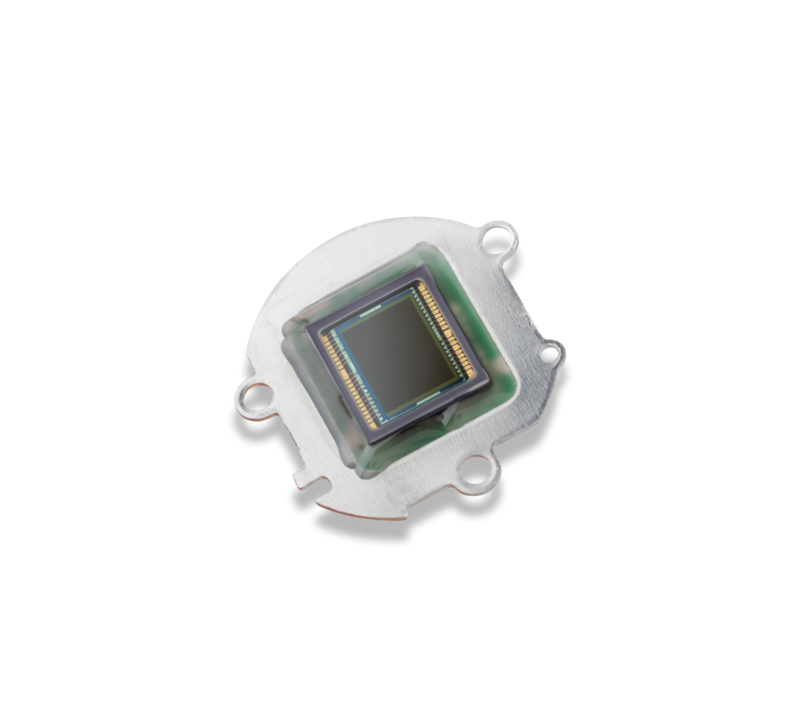 Paired with a compact 1/2.8" 1080p sensor, the Triton offers full-HD sharpness while maintaining the zoom clarity that only optical zoom can provide, from a wide 67° angle through to a narrow 2.4° horizontal field of view. Just as the human eye relies on the presence of an adequate light source to see, security cameras must be provided with proper illumination to capture high-quality images and video. 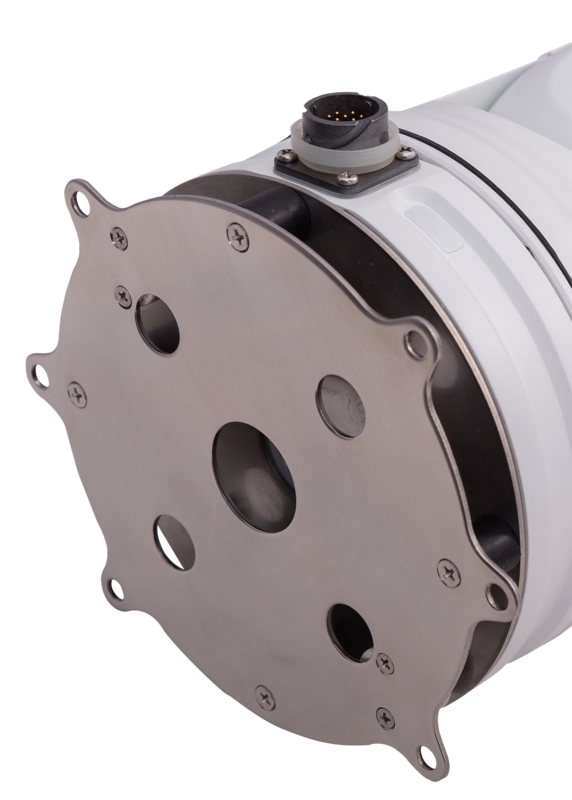 The Triton’s 3 IR LED array provides up to 50m (160ft) of IR illumination when there isn’t enough natural light available. 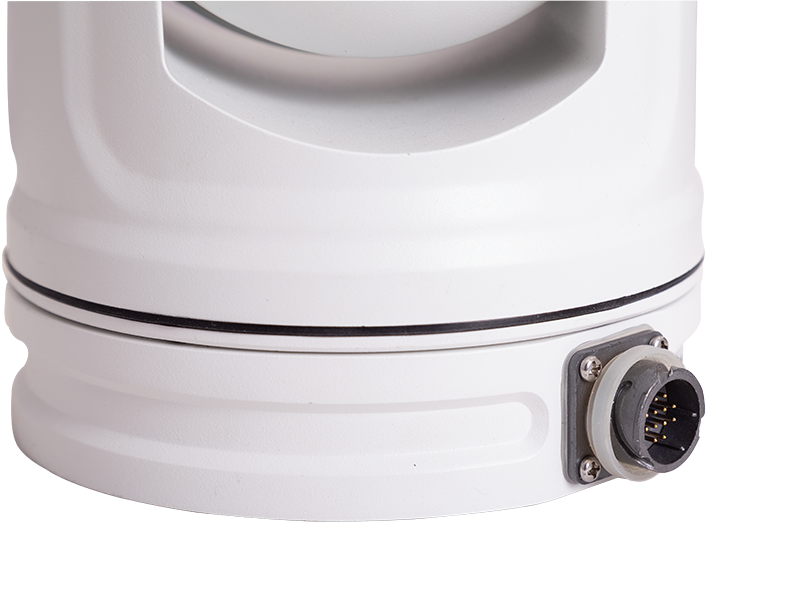 An electronic photocell automatically activates the IRs in low light, ensuring optimal 24/7 day night imaging, even in complete darkness. 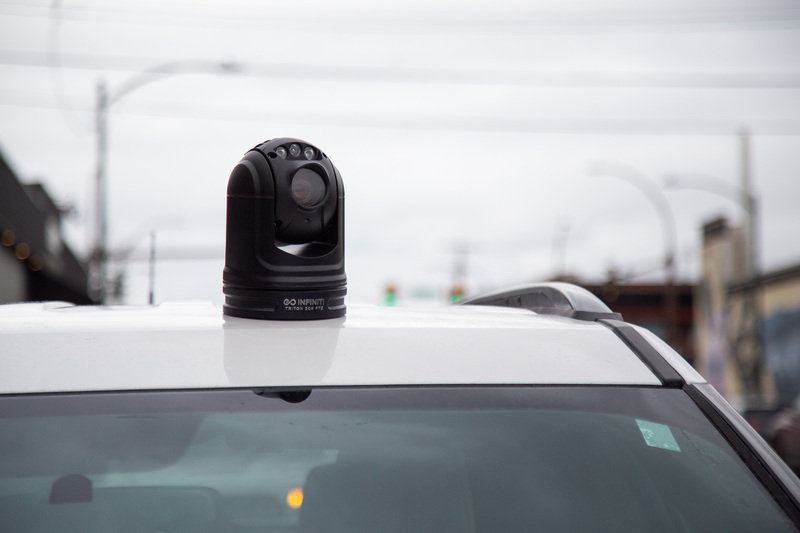 PTZ (pan/tilt/zoom) capability means that the Triton can be controlled from a remote location, enabling users to cover multiple areas of interest with the ease of a single camera. The remote movement is powered by the camera’s precise pan/tilt motors, which are controllable via software or joystick controller and allow the user to tilt the camera up or down and spin it left or right at speeds of up to 80° per second. The Triton's enclosure is designed with an ingress protection rating of IP66, protecting the internal components from dust, dirt and liquids. This protection allows the Triton to withstand a wide variety of environmental conditions including rain and snow. A built-in magnetic mount opens up a world of possibilities for placing your Triton in the perfect position. Giving users a lot of flexibility, the magnetic mount requires zero tools or screws to set up, which is a huge time savings. The powerful magnets make the Triton quick and easy to install and adjust for optimum positioning. This portable camera support is able to work effectively both indoors and out. 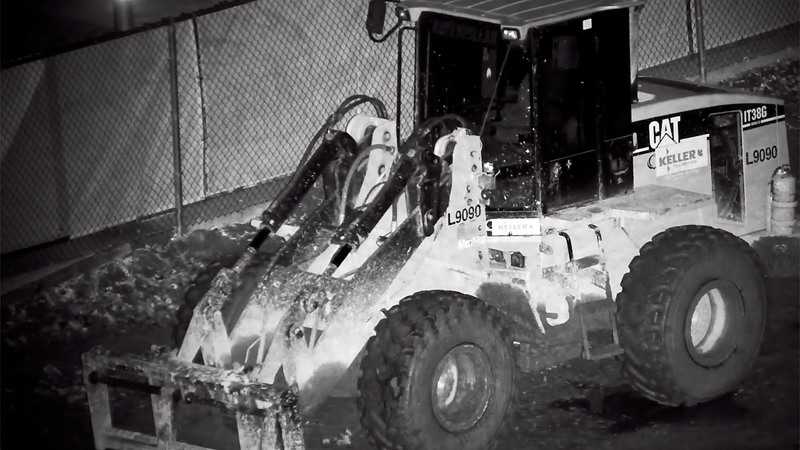 The anti-vibration mount works to achieve a clearer picture even in turbulent environments. 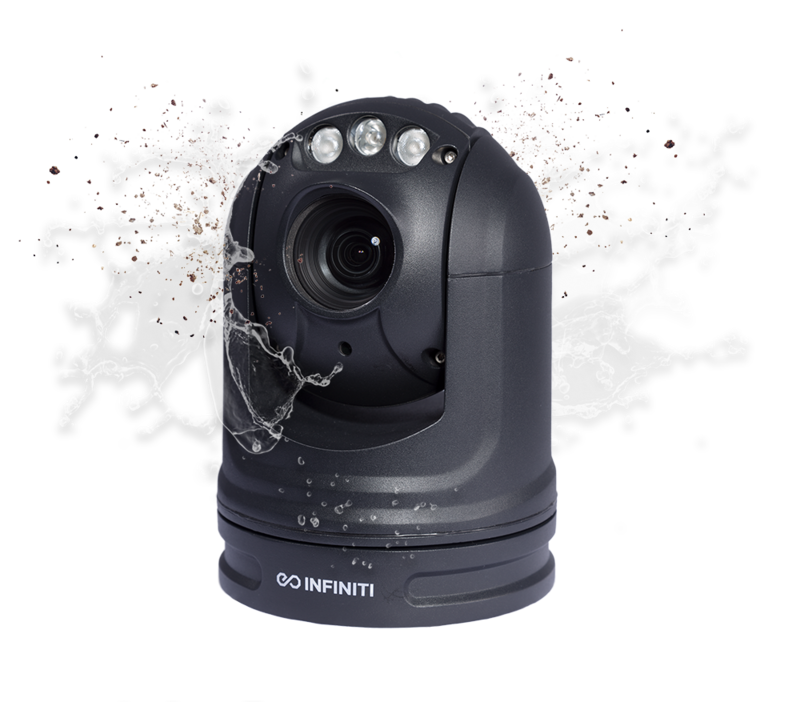 This is achieved by minimizing the level of vibration transmitted from the Triton system to its external surroundings through absorbing much of the vibration before it affects the camera and the resulting picture. 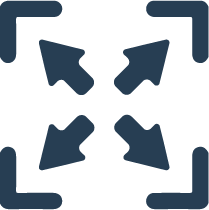 Small, lightweight electronic systems that don't use much power are massively advantageous in a variety of situations. The Triton’s compact size and design allows for easy mobility and mounting versatility. The Triton uses just 20W of power, making it ideal for solar or other low-power installations. Weighing in at under 5 pounds, the 2.6kg Triton is an easy addition to many surfaces or tactical situations. The Triton’s communication cable uses a rugged military-grade connector that locks the cable in place while protecting it from rain and dust. 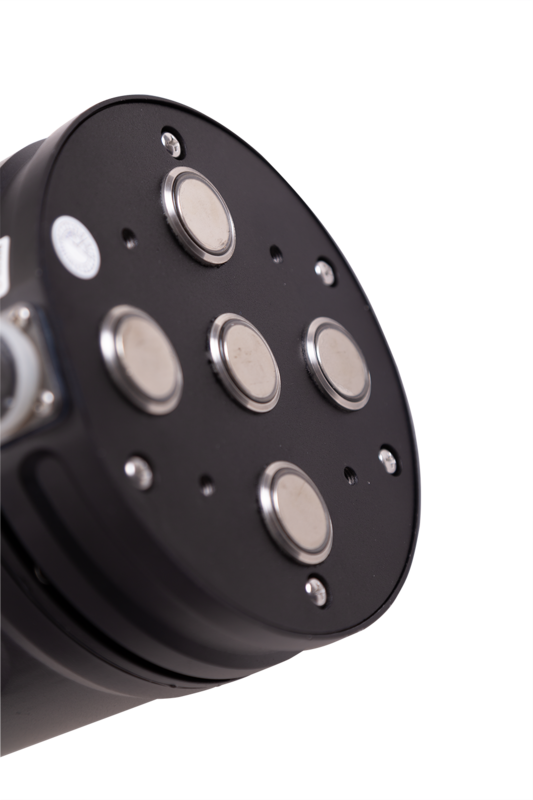 It has the added advantage of being incredibly quick to connect or disconnect, making the Triton an ideal camera for a rapid deployment solution. 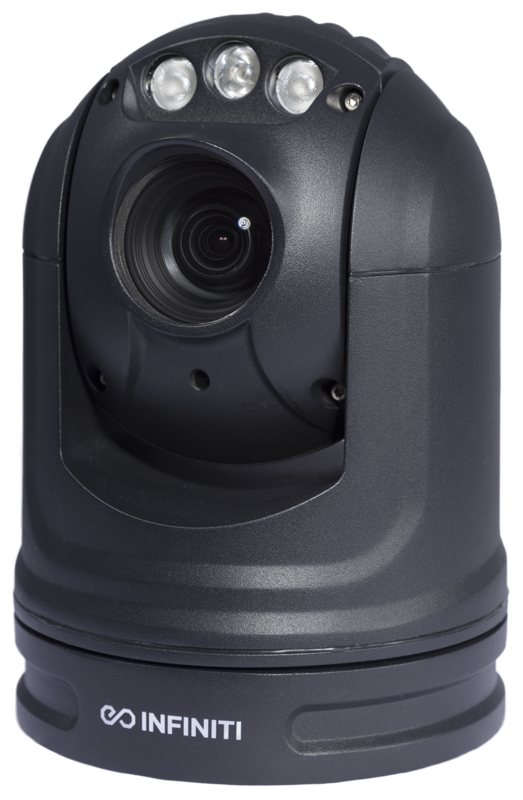 The Triton is an IP network video camera system, allowing the video to be distributed over wired, wireless and cellular networks. Alternatively, the Triton can be ordered with analog video output or SDI video output (with a large quantity order). RS485 is included for precise control of the camera using an optional PTZ joystick. 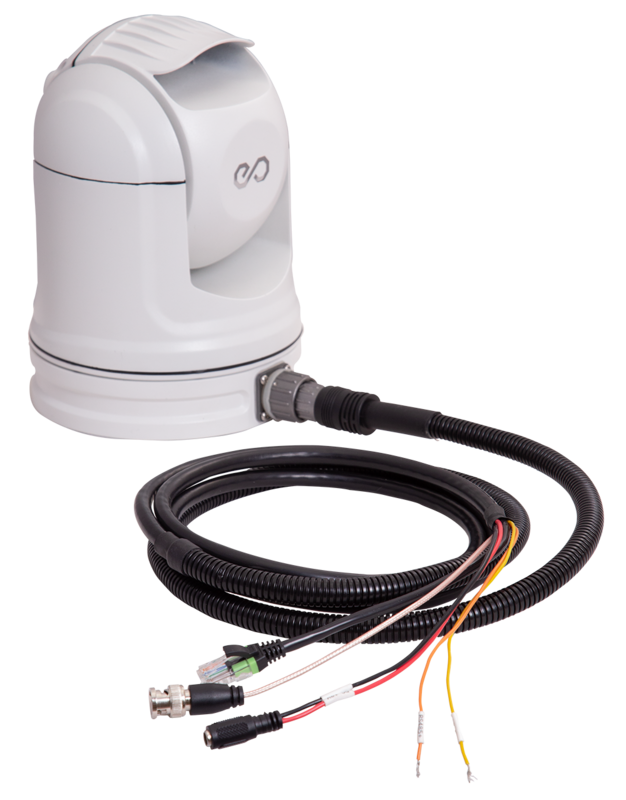 Our standard breakout cable is included with the Triton, however we can also customize the configuration in a number of ways, including adding a weatherproof junction box for remote installations, extending the length of the cable, or even creating a rapid deployment kit that can power, display and control the camera with a quick and simple connection.